I’ve been a bit quiet for a while…. I haven’t posted anything for a while because I have been busy trying to sell my house but I’m back now and although I am currently surrounded by packing boxes and piles of things ‘to sort’ I have been working on a few commissions which I will be posting about in the Studio Jewellery page. Silver Violet and Bud Bangle. 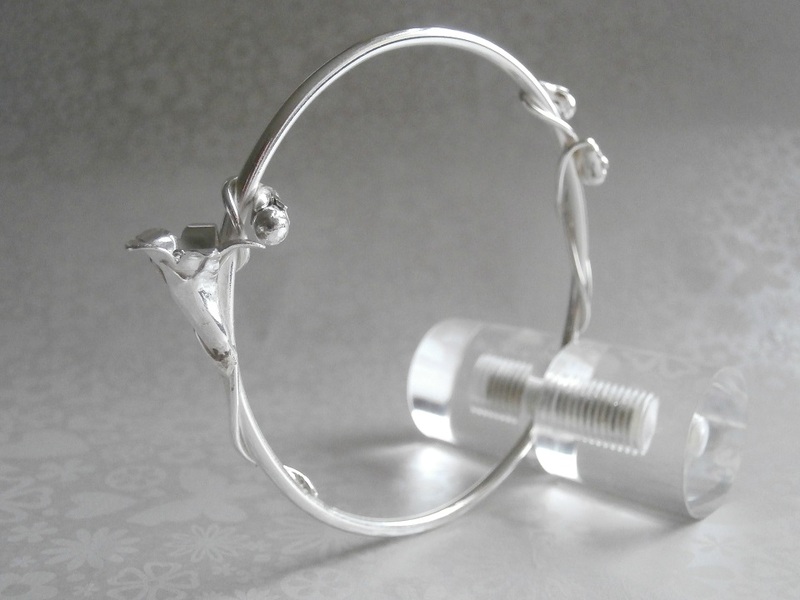 A simple bangle with winding violet buds twisting around the two sides of the bangle and one open flower. It has been made for an ‘Annie’s mum’ who has always loved violets and it is going to be a gift from Annie and her two granddaughters who commissioned me to make the piece. I love making and using flowers in my jewellery as I like to take something beautiful, that in real life is almost impossible to preserve, and create something lasting that will continue to give pleasure to the wearer. I am also fascinated by the connections and significance given to what flowers represent and mean, in this case spiritual wisdom, humility and faithfulness- qualities that I am certain will have been identified by Annie and her daughters in their mother and grandmother. 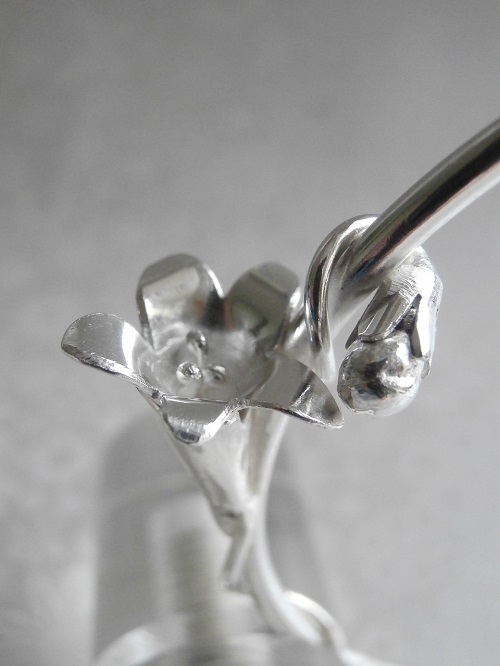 The flower and buds have been made from silver sheet, wire and tube that have been hand cut, filed, formed and soldered in parts before careful and delicate assembly (not for the faint hearted!). As with all commissions there is a personal expectation to finish a piece to an even higher standard than usual. It comes from knowing the background of and information about the recipient- the design and making process becomes very personal and as it develops I feel an increasing connection between myself and the recipient even if I haven’t met them directly. I can only hope then that Annie, her mum and her granddaughters will all be as pleased with the bangle as I am.